Test yourself in a realistic enviroment to see if you have what it takes to begin trading professionally. Get a funding offer from our partner company. Pursue the career you've always wanted. The Gauntlet™ is a custom developed Futures trading evaluation tool that will determine if you are ready to trade live in the Futures market, and it is the final step in our education program. The evaluation is based on a few hard rules enabling the trader maximum flexibility in pursuing their preferred trading strategy. It should be attempted after finishing the Beginner Crash Course and spending significant time on a trading simulator. Those with ample experience in the market already can attempt to pass The Gauntlet™ as well. We've partnered with proprietary a proprietary trading firm to validate your Gauntlet™ performance. Upon successful completion of The Gauntlet™ your results will be sent to our proprietary trading partner, who will review your results and bring you on as a funded trading partner of their firm. Earn2Trade will also issue you a certificate upon successful completion as a symbol of passing The Gauntlet™. What are The Gauntlet™ rules? We acknowledge that every single trader is different, and our proprietary trading partner, Helios Trading Partners is looking for diversified traders. Therefore, we only have a few rules in order to successfully pass The Gauntlet™. Candidates also have the option of choosing preset stop losses, daily losses and weekly loss limits, as well as setting their own additional rules for the 60-day evaluation period. It's important to note that if a candidate chooses to set their own rules, they should do their best to abide by them. What offer will I receive upon successful completion? If a candidate successfully completes The Gauntlet™ they will receive a guaranteed funding offer from Helios Trading Partners. The offer contains, but is not limited to three main points, including the funding amount, the maximum drawdown and the profit split. Funding falls within a $10-25,000.00 range, and all of the funds are available for the traders from day one as available margin. 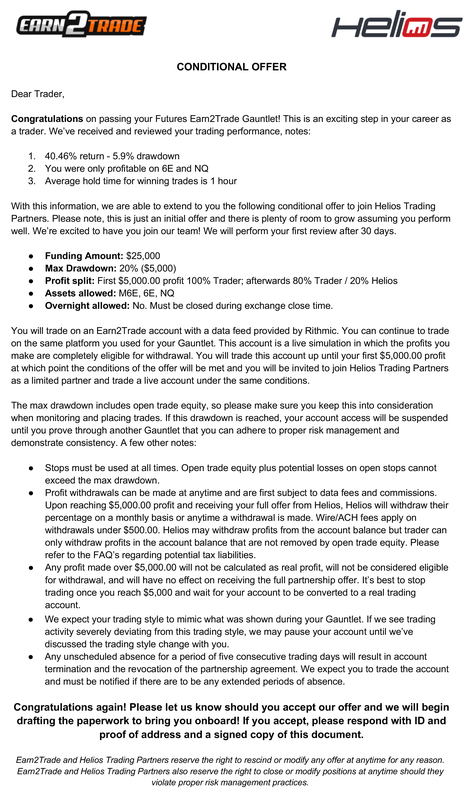 While Helios Trading Partners examines all aspects of the report produced by The Gauntlet™ trader evaluation program, in order to achieve the higher ranges of funding, drawdown and profit share, the candidate should exhibit a consistent trading style that reflects the trading plan submitted at the start of their evaluation program. In addition, the profit to drawdown ratio should be stronger than 1:1 and reach more standard industry targets of 1.5:1 or better. Here's an example of a real offer sent to a successful candidate from Helios Trading Partners. The Gauntlet™ is a one time payment of $349.00 for the entire 60-day examination period. There is no automated rebilling. How long is The Gauntlet™? The Gauntlet™ is 60 calendar days. It cannot be completed in an earlier time period than the entire 60 days, even if the profit target is met earlier. The intention of The Gauntlet™ is to gauge how a candidate will trade over the entire period, even if the minimum profit target is hit earlier. Can I reset The Gauntlet™? Yes. If you're currently taking The Gauntlet™ you can reset it at half price ($174.50), however, you will need to trade for 60 calendar days starting from the reset. Please note that you can only reset at half price before you go over the 10% drawdown limit. Does my 60-day evaluation period start immediately upon purchasing The Gauntlet™? After the purchase, you will have 72 hours to set up and start your Gauntlet™. If you don't set up and start your Gauntlet™ for more than 72 hours, the evaluation period will start automatically, regardless of your preferences. Journalytix is a next generation automated trade analytics and journaling tool with a built-in real- time news feed. The tools reveal patterns in trading data that help traders understand what’s working for them and what isn’t. Traders not only get up to the minute analytical information about their day in terms of both P&L and Risk, they also get a heads up in terms of both scheduled economic releases and market moving news, tailored to events that are likely to impact their trading. Trader Support Dashboard - Journalytix "Day Overview" combines a real time audio news feed, economic release warnings (1min, 5 min prior to release), real time economic news announcements and Profit, Risk and Open P&L charting - to give you a single view that ensures you are always aware of how your day is progressing, how that compares to your typical day and what events are shaping the days action. Trade Journaling & Tagging - within seconds of creating or closing a position on your trading platform, trade details are automatically sent to our servers. A friendly, unobtrusive notification will give you 1-click access to the journal for that position where you can - voice dictate notes (130 languages supported), categorize the trade, add free-format hashtags and attachments such as screen shots or videos. Advanced Analytics Dashboard - Analyze your trade history to discover what's really impacting your P&L - good & bad.Analyze by trade types and the free-format hashtags you added to the positions, find out which instruments, what times of day, what behaviors are really driving your bottom line. Playbook - as nothing works all the time, the playbook is your repository to save information about your trading rules and which market conditions best suit each set up. Many traders without a playbook move from one setup to the next without realizing those setups only stopped working because volatility shifted. When volatility returns to it's prior state - those setups represent opportunity once more. P&L Calendar - at a glance monthly/weekly overview of performance overtime. Spot outlying days in terms of good/bad performance and trade frequency - then zoom in to review what you did on those days & what was going on in the markets, so that you can better learn from the experience. We're looking for Talent. Get The Gauntlet™ for Free. Do I have to reach 20% profit and 5% drawdown to qualify for a refund? You will receive the cost of your current successful Gauntlet™ reimbursed to you in your Professional Helios Trading Account. You can withdraw this money immediately at your discretion through ACH or wire transfer, or choose to add it to your trading balance. How much do I get refunded? You will be refunded the amount of your current Gauntlet™ cost. That means, if you paid $349.00 for your current Gauntlet™, $349.00 will be reimbursed to your Professional Helios Trading Account. This money can either be withdrawn or added to your trading balance as you see fit. “I gotta say these guys are excelente mentors, they teach and explain everything step by step clearly with easy understanding for anyone who hasn’t seen any financial lesson before. Enroll now to our mentoring-based education program, test yourself, practice - plus get an offer after successful completion!